In the early 2000's, Ludacris was huge... as well as Nate Dogg... as well as 50 Cent. Area Codes, which can be heard in the original Fast & Furious movie, but is not on the soundtrack, was a big urban hit. It implemented the smooth R&B vocals of Nate Dogg with the gritty, party lyrics of Ludacris. In 2016, 15 years later, I have remixed this classic by adding a smooth R&B sample from the 1997 hit Too Close by Next to compliment the smooth vocals from Nate Dogg. You can also hear 50 Cent and his sexually charged lyrics get into the action. This is a smooth R&B/hip hop crossover remix. 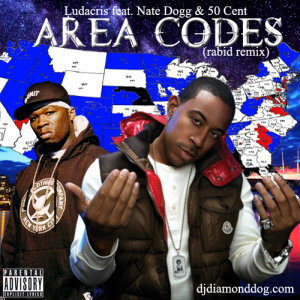 You can stream Area Codes (rabid remix) above and you can download the remix single here (feat. an extended, instrumental & acapella). This is yet another untagged remix, so it will be very friendly for the DJ's. Stay tuned to djdiamonddog.com for more great summer music coming soon!! This was originally remixed in 2010 and featured on the Platinum Band mixtape. Wretches & Kings is already a high-powered political track in it's original form. However, it takes a whole new level once Chuck D drops lyrics on it. The entire track is a powerful, conscious, political track, and speaks against the injustices of a corrupt government. Injustices that have been present for centuries. If you like conscious music, then this one is great for you. You can stream Wretches & Kings (rabid mix) video above and you can also download it here. If you enjoy it, please view & share it via my YouTube link. There can never be too many ears to listen to a consciously political track, especially at a time when politics appears to rule everything. Thanks for your support. And please, research and question EVERYTHING... especially before you vote this year.